Every Instagram user tries to enlarge the followers community to have more exposure on social network. There are popular Instagram accounts that have millions of followers and they are getting more daily. What methods do they use to grow their accounts? 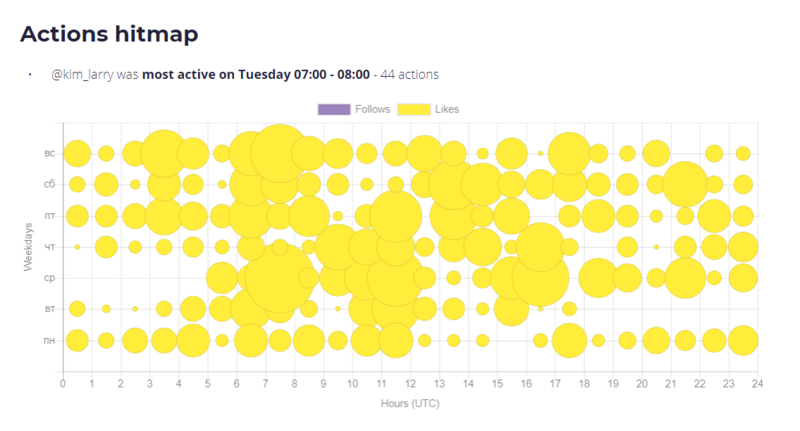 In our previous article, you can learn how to detect if the method used is organic or automated: first, you monitor someone’s Instagram activity within 2-3 weeks using Snoopreport, then check Instagram likes and follows and compare with the usual user behavior on Instagram. Therefore, you shouldn’t apply many efforts to stalk someone’s activity on Instagram and research an user growth strategy. In addition, Snoopreport app gives an opportunity to see what someone likes on Instagram and to collect more data for in-depth analytics to make up a detailed report of user engagement and to prove the research results. The mass liking method supposes the use of bots that make likes on Instagram on your behalf. 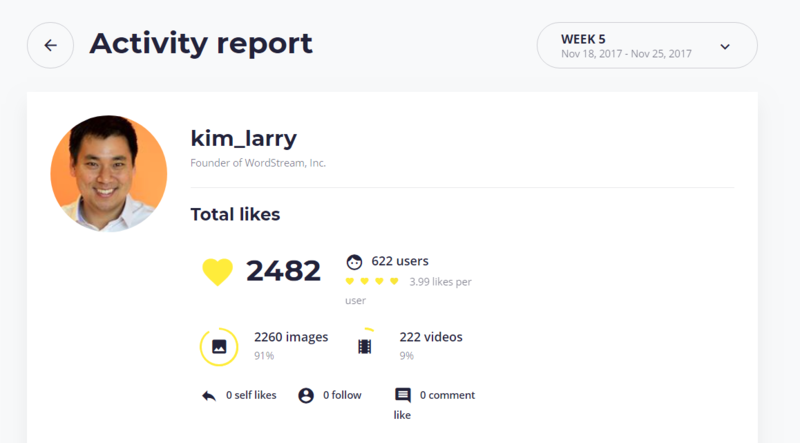 It can be detected easily if you spy on Instagram account and see the amount of likes made by the user. Above you can see that the user made 2482 likes within one week. 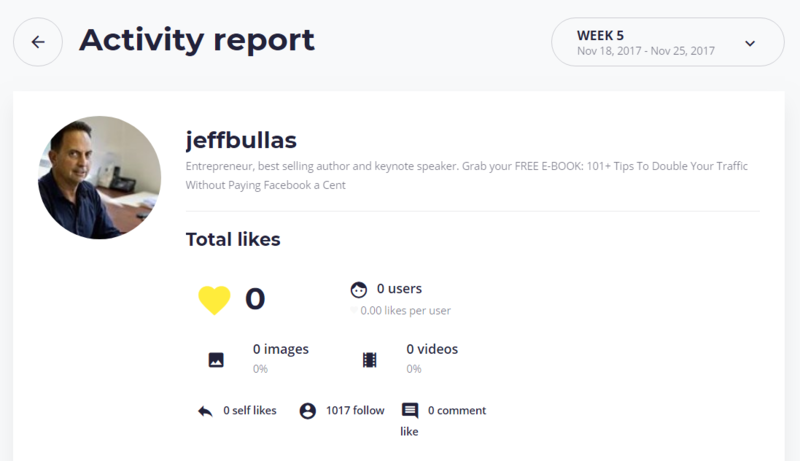 Obviously, a common user doesn’t like so many posts during a week – the usual number is about 50-500 likes. Snoopreport provides the metrics that shows the period of user activity – the Actions Hitmap. This figure shows activity 24/7 and peak and low hours so you can estimate target time zone (time set in PST) that is probably west coast. You can also see Instagram likes and highlight the hashtags used to target Instagram users to make likes. Liked media tags cloud displays the liked posts hashtags; the hashtags that are used more have a bigger font size. If you chose the tags list, you will see the number of posts with following hashtags. Account set the automation on #socialmedia, #digitalmarketing, #thanksgiving, #socialmediamarketing and so on. 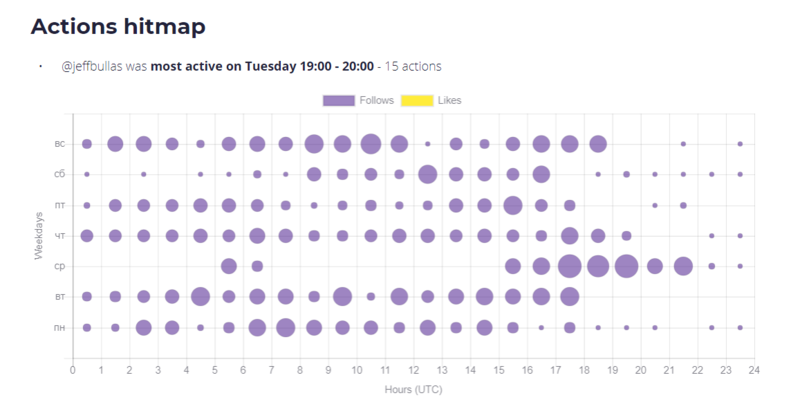 If you study Instagram following activity you can stumble upon another automated way of attracting more followers to your Instagram account – follow-to-follow. Instagram bots follow other users instead of you and there is a great chance that these users will follow your back. 1017 follows is an enormous number for a regular account in one week when the usual Instagram activity is about 20-30 follows. When there is an equal number of follows distribution and the follows continue 24/7, it means activity is 100% automated and more than that evenly distributed to avoid bans. After checking Instagram activity and researching of other users’ engagement strategies, you can decide on your own and use some of the method applied. Is it ethical to stalk Instagram actions?